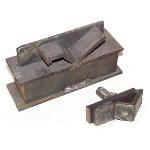 These dies are suitable for arbor press, fly press and hydraulic press. Both make more than one bend at a time. Although they do similar jobs they are constructed differently. Russel's 45/90 dies (Figure 17) are made from welded up scrap flat bar and the upper die has a 3/4" shank to fit his flypress. My spring clapper die to the right makes an offset and a slight curve. 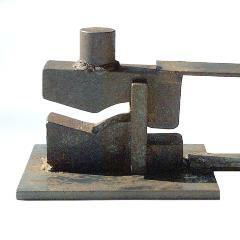 It was torch cut from heavy steel plate and ground to shape. The back of the die is a stock stop. It was designed for use on a hydraulic press and the spring makes it self opening. The shank fits nothing, it is just an extension to push against. 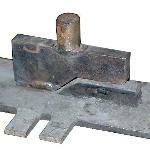 This bending die will work in almost any kind of press. The forth figure is a bender by George Dixon used in a flypress.